“HEY APATHY! 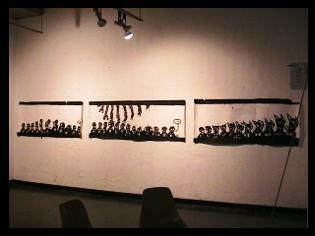 Black and White Pictures, Street Art & Demonstrations” was a large drawing, performance and lecture presentation held at the Definitely Superior Art Gallery, Thunder Bay. Mechanized monstrosities bombard the metropolis as giant billboard robotics smash through the skyline and hand held devices assimilate the minds of the city’s citizens! 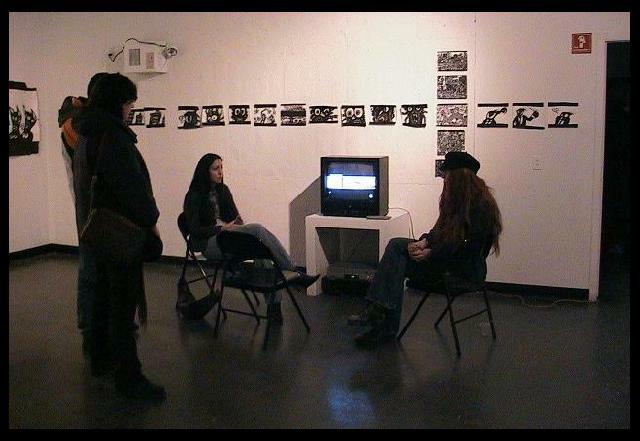 Featuring a broad assortment of street paintings and comic book drawings, the Definitely Superior Art Gallery hosted an ink stained extravaganza in the winter of 2006. The primary goal of the exhibit was to question the validity of technological progress as it relates to life in the metropolis. At that time there was a noticeably visible increase in the use of small computerized devices in the metropolis core. Although cell phones, portable music, and blackberry’s were already common, the use of hand-held robotic equipment achieved new levels of widespread popularity following the release of various technological innovations and certain excessive advertising campaigns throughout 2005-06. As a street artist and anthropological observer, I witnessed the sociological transformation first hand. Peoples faces melded with machines, their ears attached with wires and the eyes evolved into a flickering glow. In the artworks the devices appear to be attacking the city like some strange science fiction fantasy reminding the audience that although often quite useful, this strange equipment can also incite alienation. Most of the artworks exhibited in the Definitely Superior Art Gallery were large scale street art drawings. These works were made with brushes and ink on heavy paper in front of live audiences throughout the summer of 2005 on Queen Street West. The show featured two of these live painting performances; an afternoon demonstration inside the local Chapter’s Book Store and another in the evening during the exhibition’s opening party. As well as the street art and performance the gallery presented several detailed studio comic book drawings, animations and an interactive lecture and question period with the artist during the gala event. “HEY APATHY! Street Art & Performances” was sponsored by the Canada Council for the Arts and the Ontario Arts Council.